About five years ago Alberta Health Services (AHS) came to researchers at the Alberta Innovates Centre for Machine Learning (now called AMII - Alberta Machine Intelligence Institute) to talk about research projects. But out of discussions came the suggestion that a really beneficial use of machine learning would be dealing with unionized scheduling, says PFM CEO Maurice Sevigny. Jason Harder, now COO with the company, was with AICML at the time and had experience with workforce management. At a previous job in Australia, he had looked for something to help with scheduling without success. This is where Jason realized that there was something to this and he became one of the founders of the company. "It was determined at the time it was a difficult enough problem that the (researchers) within AIMCIL would take it on," says Sevigny. Two professors and four grad students worked for two or three years to come up with a set of algorithms to handle the puzzles involving meshing shifts and full-time equivalent positions and evening out shifts over periods of time in a challenging unionized environment. "We hired a couple of programmers to take those algorithms that they had produced and turn them into computer code - that’s what we built our engine from...and that’s really the genesis of PFM." Sevigny was approached two years ago by Cameron Schuler, executive director of AMCIL, to take PFM into the private sector. Sevigny had product management experience at tech firms Intuit and SciQuest and had been a consultant. The template the institute has established is designed to create these types of spinoff companies from the research community at the university. "They incubate the organization and once there is a commercial, viable product they roll the company out of AMII and become a private sector company," says Sevigny. In October 2015, PFM Scheduling was featured as part of Launch Party 6 - Startup Edmonton's flagship event introducing early-stage startups to investors, customers and the community. In November 2017, PFM won a spin-off company innovation award from TEC Edmonton, a joint venture of the University of Alberta and Edmonton Economic Development Corporation that supports and incubates technology companies. Jay Kumar, vice president of technology management for TEC Edmonton, says there are excellent ideas coming out of U of A in terms of patents and companies and the awards are designed to not just recognize but encourage commercialization of those ideas. The company had to meet some benchmarks for the recognition, Kumar says. TEC Edmonton deals with firms past the startup phase, with an independent corporate structure, its own management people and production in place. The awards serve as a showcase for the company and hopefully allow investors to take a look at them. PFM hasn't completely flown free of the university. The company has office space on campus and the university is a shareholder. The firm is still fairly small, with four full-time employees and one part-time. So far PFM has done work for the United Nurses of Alberta and AHS. It is in discussions with the Alberta Union of Provincial Employees and B.C. Health. Sevigny says the firm's software isn't only aimed at healthcare institutions. PFM has also talked to a construction firm and is considering moving into transportation and hospitality sectors. The five-year plan is for PFM to reach $20 million in revenue and probably grow to 40+ employees. Kumar admits there is always the concern that companies will leave Edmonton once they get to a stage of doing business outside of Alberta. That support includes the growing AI and machine learning community in the city. "They need a willingness to invest in areas potentially outside of their current business model or understanding," he says. 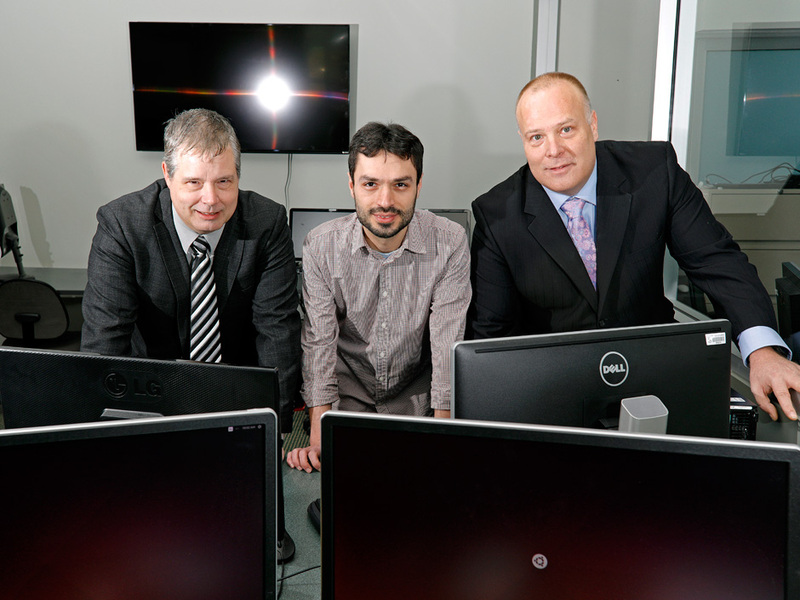 PFM Scheduling Services team, from left: CEO Maurice Sevigny, research developer Amin Jorati and COO Jason Harder, at the University of Alberta. Photo credit: Finacial Post. Are you looking for support as you start a company? PFM Scheduling is a Launch Party alumni company! We're proud to support founders and their teams through a variety of programs and mentorship opportunities. Interested in launching your own tech company? Connect today for a one-on-one session to get started with Startup Edmonton.